Keen to try other ways to cook the Tambda Rassa, I decided to try cooking lamp chops with a simple spice rub that included the Kolhapuri masala, ginger, garlic and salt. Since I had to cook these for dinner, I could marinate them only for 10 minutes. I decided to cook them in a pressure cook, in order to ensure the meat would be tender and cook fast. So after searing them on both sides to get a nice brown colour, I made a simple gravy of onions, tomatoes, a little extra ginger-garlic paste and a little more Kohlapuri masala. Then added some stock, returned the mutton chops to the cooker and cooked them on low heat for 30 mins. Ta-da! Perfectly cooked and seasoned mutton chops! 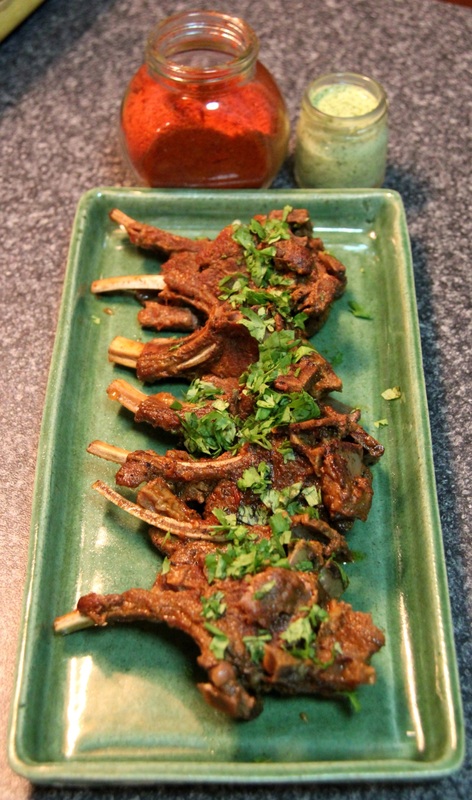 This entry was posted in Marathi cuisine and tagged kolhapuri masala, mutton, mutton chops, spicy. Bookmark the permalink.